Barb’s sudden departure was one of Stranger Things’ more shocking (and ultimately disappointing) plot developments that killed off a great character in order to drive the show’s story along. But what was always odd about Barb’s death was how barely anyone else in the show’s town really seemed to notice other than her friend Nancy—including her own parents. Thankfully, Netflix finally got around to giving Barb the long overdue respect she deserves in the form of a shrine that looks like something an ‘80s Dress Barn threw up. 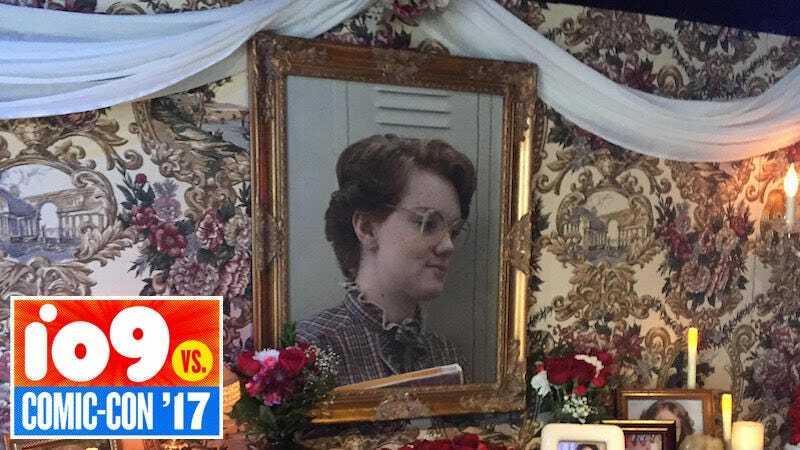 Surrounding a huge photograph of Barb mounted on a wallpapered board are fake candles, gas station flowers, and letters of mourning no doubt written by people who knew Barb during a touching Barb-centric montage that belonged in the show. The shrine is tacky and heartfelt and depressing all at once, which is to say: Barb probably would have loved it.